Combining Niantic's Pokémon GO with Rockstar's GTA 5, Ludicrous Beach have made this unique and creative mod, whereby you can quite literally play the mobile game in the GTA universe. Seeing as Pokémon GO has taken the world by storm, this smart GTA 5 mod has not just allowed you to throw a few balls and chase Pokémon around, it's truly solid and functional. It's XP system is a total replica to the app, giving that familiar and easy to follow feel. Every 5 minutes the game will autosave your progress, so if you close and re-open the mod, your progress and inventory items will still exist! As you travel far and wide across Los Santos, level 1 Pokémon will appear around you and they can be captured by throwing Pokéballs. Once caught, they will be saved in your inventory. One impressive feature is the leveling up system; not only will you be able to catch an array of Pokémon, they will also level up once you catch 10 of the same wild Pokémon. It would have been pretty sweet to just chase this little creatures in a Grand Theft Auto game, but the fun doesn't stop there. There are actual PokéStops and they're scattered all around both Los Santos and San Andreas. You can collect eggs and items from these little vending areas on foot and, in true Pokémon GO-style, they can be revisited every 5 minutes. Eggs have also been thought through well and even come in standard rarities. 2k, 5k, and 10k eggs can be hatched and the larger the distance of the egg, the higher level Pokémon you'll hatch from it. This incredible mod even includes a clever little feature that Pokémon GO doesn't have just yet. After you have captured your Pokémon, you can assign them to be your personal pet. They will follow you around the streets of Los Santos and, if you get attacked, they'll even defend you. You're also able to manage which little dude you want to set as your personal Pokémon via your inventory. Travel Far and Wide Across Los Santos and Catch 'Em All! The Pokémon GO GTA 5 mod can be found on GTA5Mods along with some further information. Karen Gravano's similar suit went with it. 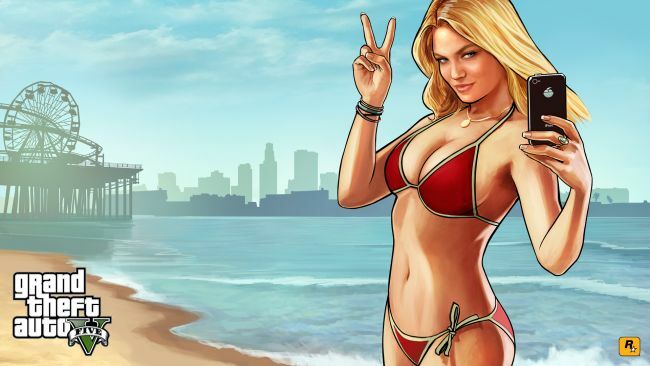 Lindsay Lohan sued Take-Two Interactive in 2014, claiming that it had used her likeness in Grand Theft Auto 5, and its promotional materials, without her permission. Lohan alleged the character Lacey Jonas was based on her, and then later said the woman in the red bikini was also her, although the Daily Dot had previously confirmed that someone else served as the model for that character. Karen Gravano of Mob Wives tragi-fame filed a similar suit that same year, saying that the character of Andrea Bottino was based on her life and likeness. Both cases have now been tossed out of court. The Appellate Division of the Supreme Court of the State of New York ruled that the lawsuits “must fail because defendants did not use [plaintiffs'] name, portrait, or picture” in the game. “As to Lohan's claim that an avatar in the videogame is she and that her image is used in various images, defendants also never referred to Lohan by name or used her actual name in the videogame, never used Lohan herself as an actor for the videogame, and never used a photograph of Lohan,” the ruling says. “Even if we accept plaintiffs' contentions that the videogame depictions are close enough to be considered representations of the respective plaintiffs, plaintiffs' claims should be dismissed because this videogame does not fall under the statutory definitions of 'advertising' or 'trade',” it continues. “This videogame's unique story, characters, dialogue, and environment, combined with the player's ability to choose how to proceed in the game, render it a work of fiction and satire,” which confers upon it First Amendment protections. Finally, Lohan's claim that her image was used to promote the game was tossed because the pictures of the woman in the red bikini “are not of Lohan herself, but merely the avatar in the game that Lohan claims is a depiction of her.” And since that claim was dismissed, there was no foundation remaining for this one. 2.press pause in the pause menu go to online then jobs ,misson and pick titan of a job. 3. immediately after picking the mission while goin up into the clouds spam right on the pad. ‘Grand Theft Auto V’ Passes ‘Wii Sports’ As The Best-Selling Video Game Ever In The U.S.
Rockstar Games announced an important and impressive milestone today that will likely be a piece of gamer trivia for years to come — Grand Theft Auto Vhas shipped 85 million copies in North America, making it the highest-selling video game in United States history. So, what game did GTA V steal the mantle of highest-selling ever from (with a wallop upside the head with a golf club before it stole the anthropomorphic game’s car)? Wii Sports. According to Nintendo, Wii Sports sold 82.3 million copies, in large part because it shipped with the extremely popular (for a time) Wii system. It also sold like gangbusters when it was released as a stand-alone title years later, but likely benefited from Wii users re-purchasing the disc after years of heavy, tendonitis-inducing gaming. GTA V no-doubt made it’s way to the top of the mountain thanks to players revisiting the game over the last half-decade. Considering gamers have been sticking with GTA: Online for four years now, it’s not entirely surprising. I’ve personally bought the game on Xbox 360 at launch, PS4, and PC. This last year saw the highest profits for GTA: Online since the GTA V persistent multiplayer mode was introduced, and with over five million copies of Rockstar’s flagship franchise shipped since May, it looks like there’s no stopping it. Not surprisingly, Take Two’s earnings report stated that GTA V has made 42 out of 50 monthly top 10 charts, the most appearances of any single title in NPD ranking history. The only thing that could possibly stop the expansion of GTA V now is Red Dead Redemption 2. Maybe.